Jane's Walk Weekend is this May 4th and 5th! 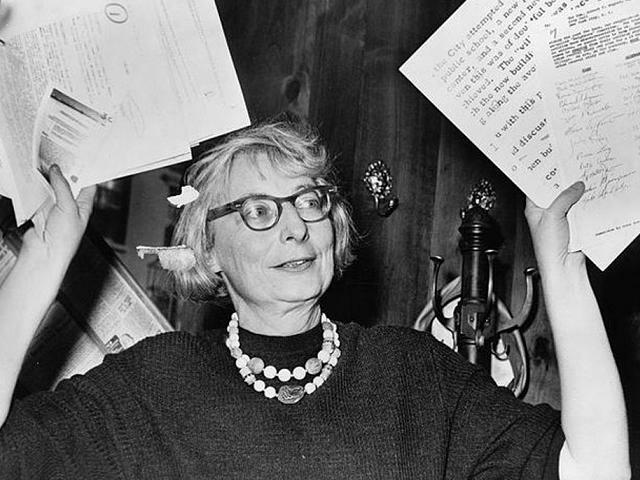 The fact that Jane Jacobs' name is so often attached to the idea of gentrification today seems a cruel irony. Jane's writing was focused on how to create strong neighborhoods that fostered robust social networks; she was far from a "NIMBY", and her interest in preservation was more about economics than aesthetics. Unfortunately, the complexity of her ideas is often vastly oversimplified or taken out of context today by people looking to generate a bit of controversy. Reports that 'Jane was wrong' are greatly exaggerated, often by people who wind up making many of the same arguments that Jane, herself, made. "Vital cities have marvelous innate abilities for understanding, communicating, contriving, and inventing what is required to combat their difficulties … Lively, diverse, intense cities contain the seeds of their own regeneration, with energy enough to carry over for problems and needs outside themselves." 1.) Levee Disaster Bike Tour, New Orleans: The Crescent City's comeback post-Katina, while far from frictionless, has been nothing short of miraculous. This bike tour will visit the sites of several levee breaches around the city, giving participants an opportunity to discuss what happened to their city, and how far they've come since. 2.) Not Your Typical Regent Park Walk, Toronto: This walk, in the city where Jane moved after her time in Manhattan's Greenwich Village, will "[shine] a light on the capacity of local residents and [reframe] Toronto’s negative 'public housing' narrative," focusing on the importance of generating new economic opportunities from within local communities rather than attracting them from somewhere else. 3.) The Roots of Mack Avenue, Detroit: This tour will focus on an historic neighborhood commercial corridor in the Motor City, which recently played host to the Placemaking Leadership Council's inaugural meeting. The tour will explore Mack Avenue's economic decline, and look forward to the bright future outlined through the "Green Thoroughfare" revitalization plan. 4.) Hometown Security, The Bronx, NYC: Led by South Bronx-based advocate Majora Carter, this tour will examine the impact of the Spofford juvenile detention facility on the neighborhood. The tour will end with a performance by a group of people whose lives were affected by Spofford, and who have worked with the Theater of the Oppressed to tell their stories. Observations from the performances will inform how the 5-acre Spofford site will be re-developed in the future. 5.) Recycle Kingdom Walk, Calcutta: This year Jane's Walk is making its way to several cities in India. This unique walk will meander through the East Calcutta Wetlands, providing an intimate look at the vital role that the site plays in the city's ecological resilience. The wetlands "take in all the solid and liquid waste of the city and generates fish, rice and vegetables and sends it back." One last thing: if you're in New York, the Municipal Art Society will be offering a host of free tours of neighborhoods affected by Hurricane Sandy last fall. You can check out the full list of related events by clicking right here.